Driving Under the Influence of Drugs in SC | South Carolina Personal Injury Attorneys | Criminal Defense Lawyers - Strom Law Firm, L.L.C. In South Carolina, it is illegal to drive a motor vehicle while under the influence of drugs to the extent that the person’s faculties to drive are materially and appreciably impaired. The penalties for a conviction of driving under the influence of drugs are identical to the consequences of a DUI conviction in South Carolina because they are the same offense. Illegal drugs are not the only things that can impair your ability to drive; several prescription drugs also carry warnings of drowsiness and to use caution while driving. If you are pulled for driving under the influence of drugs, you may be asked to submit to a test in which your urine is screened for the presence of drugs. Arrested for driving under the influence? Criminal defense lawyers at the Strom Law Firm, LLC provide a free consultation to discuss the facts of your DUI case and to discuss whether to plead guilty or not guilty. 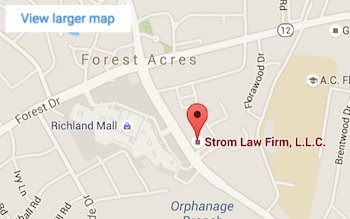 Founded by a former U.S. Attorney, the team at Strom Law also includes a former Public Defender. The firm is awarded the highest Martindale-Hubble ranking and collectively holds more than 50 years of complex litigation experience. Fill out the Free Case Evaluation form or call us immediately (803-252-4800). Let us fight your DUI charge, and help you protect your freedom and future. We offer flexible payment plans and accept Visa and Mastercard.